While everybody is watching Federal Reserve today – no doubt – I had a look at a bulk of mid-caps with strong profiles. This week I have chosen one from management services industry. ICF International is based in Fairfax, VA and provides technology-based services including management, policy consulting, and implementation services. The company delivers its services not only to commercial customers but also to the government. ICF International was selected as one of five contractors to set up “centers of excellence” to manage IT modernization throughout the federal government. It modernization is part of Jared Kushner’s (Donald Trump’s son-in-law) policy portfolio. The company has been doing well so far, if we add government contracts of this scale, the future profit is perhaps bright rather than dark. The last four reported earnings have fulfilled or beaten the estimates every time, while revenue has been rising on yearly basis. ICF International has been developing its upward trend (blue lines) since last year. It has broken the 200 SMA in September and successfully tested it in February this year during the market correction. An important fact is that the after correction volatility did not cause any decline in the price. The investors held and even bought more of the stock, which signals a healthy profile and strong interest. 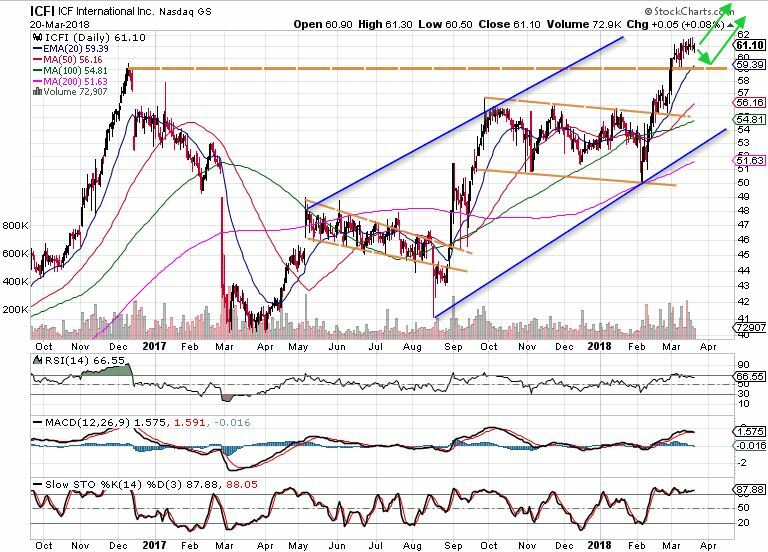 Finally, ICF International has broken a long-term resistance level (horizontal orange dashed line) at the beginning of this month and keeps it above for considerably many trading days. The resistance has now become a support level. The stock may reverse to test its current support or only 20 EMA before going up again. Both fundamental and technical analyses show favorable results for ownership of ICF International. The stock applies well to trend following strategy when its price might be driven to significantly higher levels.